Daily Illuminator: Warehouse 23 Ho-Ho-Holiday Sale Happening Now! 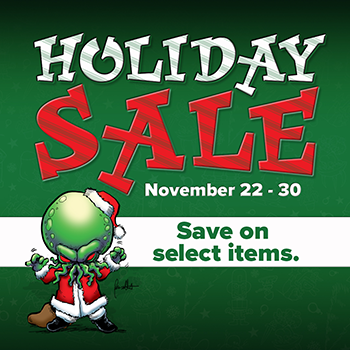 November 24, 2017: Warehouse 23 Ho-Ho-Holiday Sale Happening Now! We're going crazy on Black Friday, giving some pretty large discounts on games, just in time for the holiday gift-giving rush! A large selection of our classic titles are available, and at prices so low that you can get your friends and family more than one . . . or just hoard them all yourself! It may put you on Santa's naughty list, but it will be worth it for these games. Don't forget that all orders come with extra promos, and that U.S. orders of $100 or more get free shipping! We also have some amazing holiday bundles for Munchkin fans who want it all. Our Munchkin Gift Pack comes with three previously hard-to-find Munchkin games, all wrapped up, with some new holiday promos from Santa! Or if you're feeling adventurous, check out our Holiday Grab Boxes, in regular or Santa-size! They include a random assortment of Munchkin loot, for a fraction of the price. Each box comes with the 12 Rules of Munchkin Christmas as well, so you can use them in game! And if you don't know what to get your favorite munchkin, pick up a Warehouse 23 Gift Certificate, and let them do the hard work of choosing. It makes a great e-stocking stuffer! Whatever you're looking for this holiday season, we've got the loot!